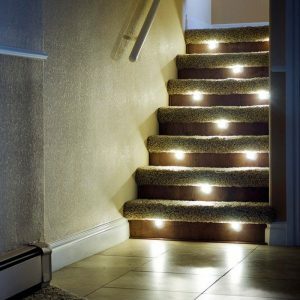 Great LED stair lights transform your home, illuminates your space, and simplifies your life. They create an atmosphere of clarity and comfort, while remaining sleek and stylish. They make your life a little easier and a little brighter. 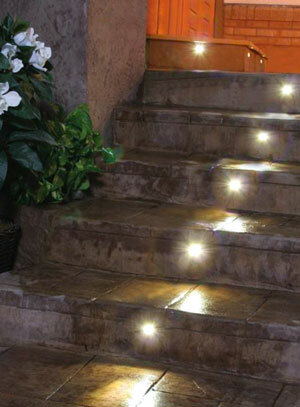 At least, DEKOR’s low-voltage LED stair lights do. When it comes to your stairs, being able to see where you’re going is an absolute must. One wrong step can lead to injury and damage, both to you and your home. And finding integrated lighting that not only brightens up your stairs, but seamlessly blends into your life, isn’t always easy. Now, high quality and low maintenance are possible with DEKOR’s Recessed Stairway Lighting. 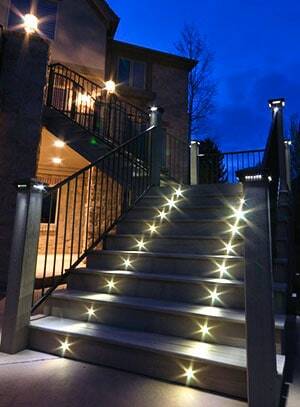 Whether you’re looking to light up your indoor stairwell, or illuminate your deck steps, there’s a DEKOR solution that’s right for you. 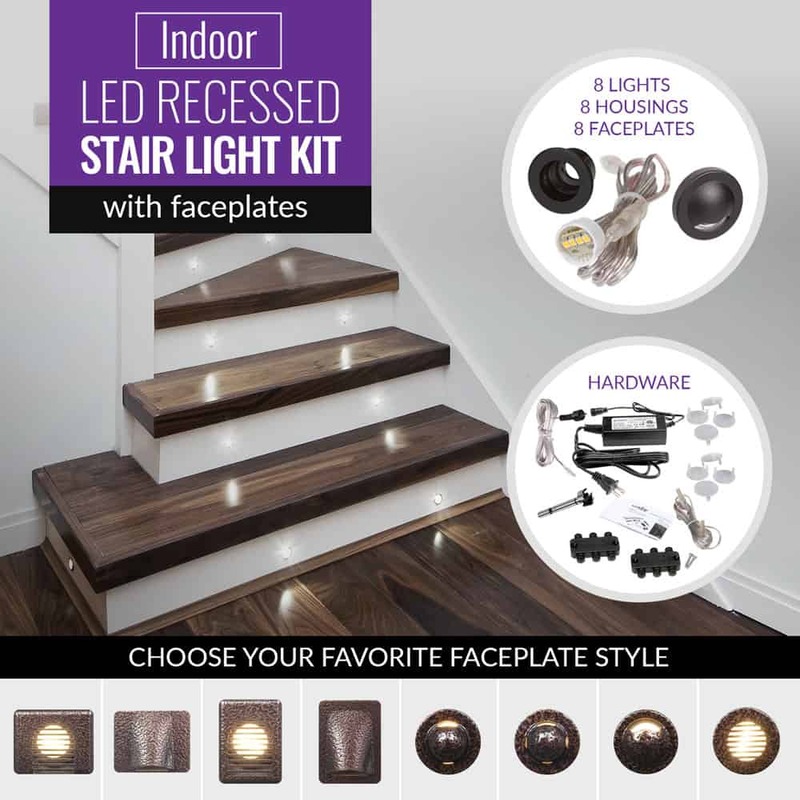 Our best-selling recessed LED stair lights are now available with LED faceplates, allowing you to add custom light accents and effects to your stairs. Choose from 8 faceplate styles in 3 powder coating finishes. With luminous Cree LEDs, perfectly flush positioning, a 30° downward angle, and an unmatched warranty, you know your home is good hands with DEKOR. And, our cutting-edge Plug-N-Play technology makes installation a breeze, helping any homeowner get the home they’ve dreamed of. All of our products and processes have been made in the USA since our start 16 years ago. Since then, people like you have been able to count on us for compassionate craftsmanship, forward thinking, and user-friendly innovations. 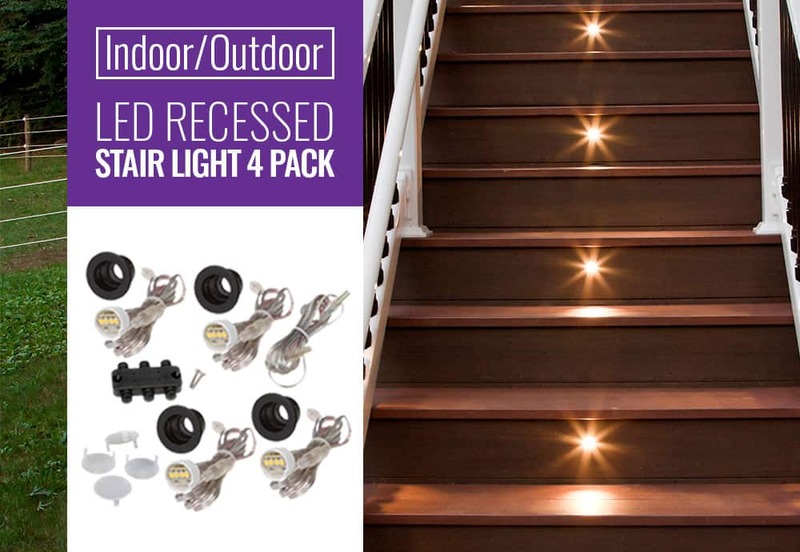 Inside your home and out, we’ll light up your stairs and lift away your stress with DEKOR LED stair lights. Watch our indoor LED stair lights project video to help spark great ideas for your home. You know you can depend on DEKOR Lighting because our products and processes are born and raised here. Unlike many competitors, we don’t outsource our materials or manufacturing to other countries. Every step of the process, from the initial stages of conception to the final product, happens in our DEKOR factory in Denver, Colorado. There, we strategize new designs, develop efficient production methods, and run our products through multiple rounds of testing. This labor of love, backed by hours of research and hard work, is done to ensure we always deliver top-tier lighting to you. I bought the recessed stair light kit & down lights all in dark copper vein. The lights really were the cherry on top of a gorgeous deck!! I love the product. My carpenter suggested it last minute when we did the project last spring. Really adds a great touch to the deck!! My customers love your LED stair lights. I’ve just sold a deck with your down-lights recessed into all the upper rails. It’s going to look great. 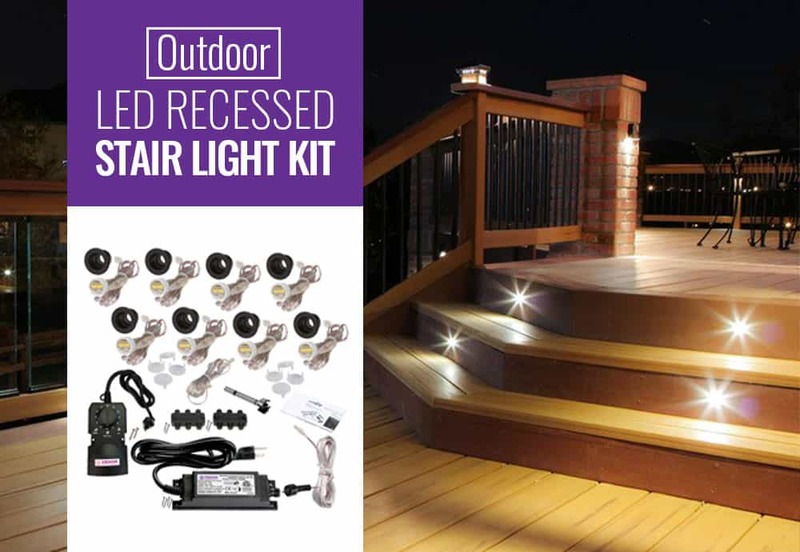 If you’ve been looking for a way to add some magic to your deck, you’ve found it with our outdoor LED stair lights kit. 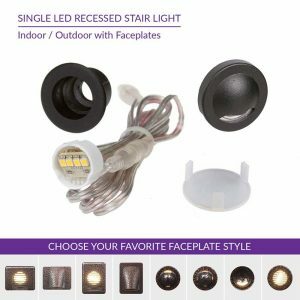 Not only do DEKOR stairway lights provide added visibility and clarity for dark summer nights, but they give extra flair and polish with the addition of our unique LED faceplates. 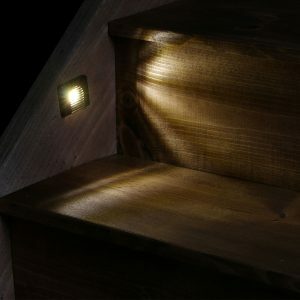 And, their luminous quality is versatile, making for the perfect LED stair lights for your dock or patio as well. DEKOR LED stair lights are designed with real people in mind, with a perfectly flush lighting installation that blends seamlessly into your steps. This extra convenience eliminates any worries or stress about damaging your lighting, since our durable housing can be walked right over without breaking, fading, or malfunctioning. In fact, our dependable housing is waterproof, enduring through sprinklers, scary storms, and long winters. No matter what weather comes your way, you can rest easy knowing your lighting will stay shining though it. Plus, powerful CREE LEDs are used in every DEKOR unit, radiating your backyard and revealing the beauty of your home. And, your Cree LEDS are aligned horizontally with 4 LEDs arranged in one horizontal row, making for a wider range of light. With a 30° downward angle, our LED stair lights tastefully accents your surroundings. 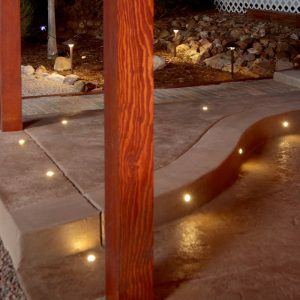 But if you’re looking to illuminate your yard at a different angle, you can customize the lighting by simply turning the housing. 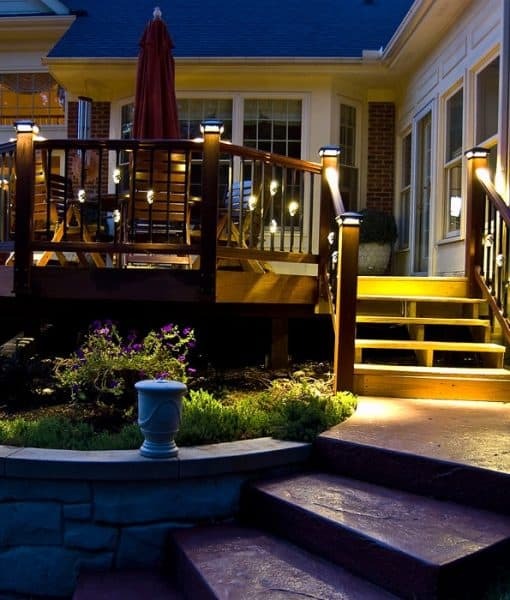 If you prefer, you can turn your lights upside down for soffit or under-deck lighting. And, we have wire length options so you can find the sizing that’s right for your setup. The lighting installation process is easy, with instructions to help guide you along the way. Our simple Plug-N-Play technology makes connecting your lights a no-brainer, your lights will be ready to shine in no time. And, our customer service line is happy to help you through every step to make sure your vision becomes a reality, no matter what you have in mind. Our indoor lighting system is a bestseller for a reason. Providing low-voltage without losing luminosity, Dekor’s recessed indoor LED stair lights system is the solution you need in your home. If you’re trying to increase your field of vision and decrease slips and falls, our lighting system lights the way to safety. With our fierce CREE LEDs, your home with glow with brilliance, all while saving on electric bills using eco-friendly technology. As with all of our LED stair lights systems, the 4 Cree LEDs in each unit are aligned horizontally in a single row, unlike our Dek Dots which are broken up into two stacked rows. 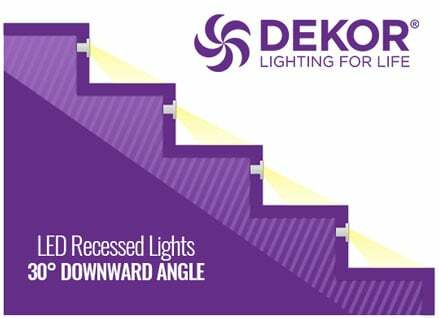 Dekor’s 30° angled indoor lighting is perfect for your risers leading upstairs, or even to your basement, but that’s not all. Our lights can be installed under hand rails or even inside cabinets, wherever you’re looking for recessed accent lighting. 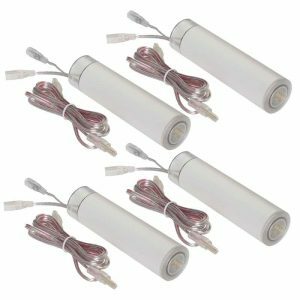 And since they’re low-voltage, they’re easy to install and line up virtually flush with your surfaces. They blend in so seamlessly with your home that you’d forget they were there, if they weren’t so bright. With our long-lasting powder coating and Cree LED glow, your home will stay beautifully lit for years to come. 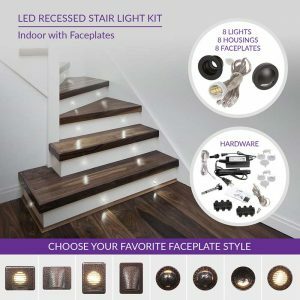 If you're looking for a standout style piece, add our newest LED faceplates to your stair lights for enhanced customization and unique lighting effects. See why the Indoor LED Recessed Light Kit is our best-selling product and order your own system today. A valued DEKOR® customer of ours found a new way to innovate with DEKOR® Recessed Stair Lights. Hear his story to get inspired! 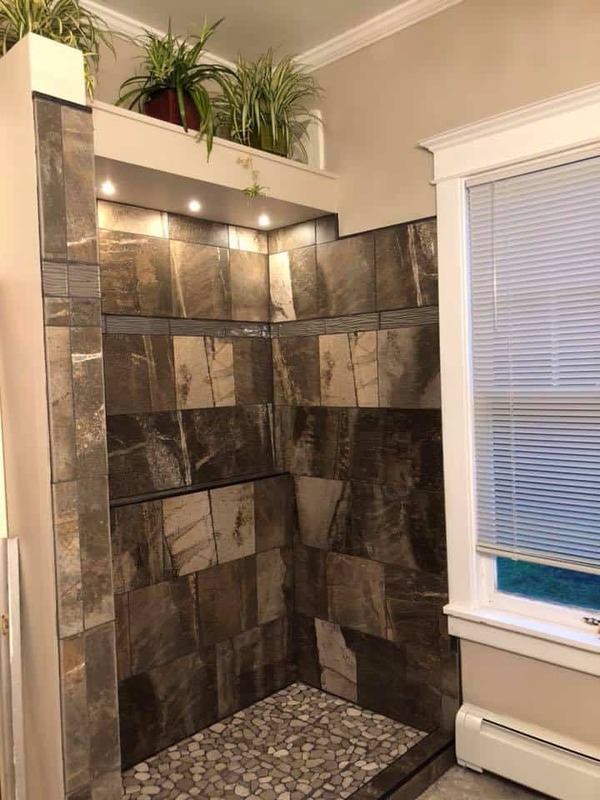 Thought you folks would like to see the finished product: Stair lights in our recently finished walk-in shower. The 30-degree angle is perfect to wash the tile walls and the dimmer remote allows us to control the lighting level beautifully. First saw these lights in a home we rented in Cornwall, UK last fall and fell in love with them – so glad we found them for this project. Already planning our next project with them! I built a half shelf above the shower - all the wires and transformer are installed inside the framing and accessible by a door in the top. We really love the lights! Finding lights that can be installed into concrete isn’t easy, but we found a way to make it easier. With our Step & Stair PAVERDOT light kit, we’ve taken the innovative housing of our PAVERDOT line and converted into a simple stair system. Using a 30° angle to cast a graceful downlight upon your steps, you can achieve the same subtle lighting for your stone without all of the headache. Like our previous stair systems, the PAVERDOT housing installs perfectly flush with your pavers, stone, or concrete. This flawless alignment ensures you won’t damage your lighting or injure yourself trying to avoid it, as it’s durable enough to be stepped on. Plus, our waterproof housing and transformer withstands the rain and snow, outlasting the crummy weather and lighting the way to sunny days. Using our efficient Cree LEDs cuts down on your energy usage, saving you money on electric bills and helping the environment. And, the 4 individual LEDS are lined up side-by-side in a single row, providing a wider range of light. Even though our forward-thinking LEDS use less energy, they’re not any less bright, with a brilliant light that will shine for years to come. 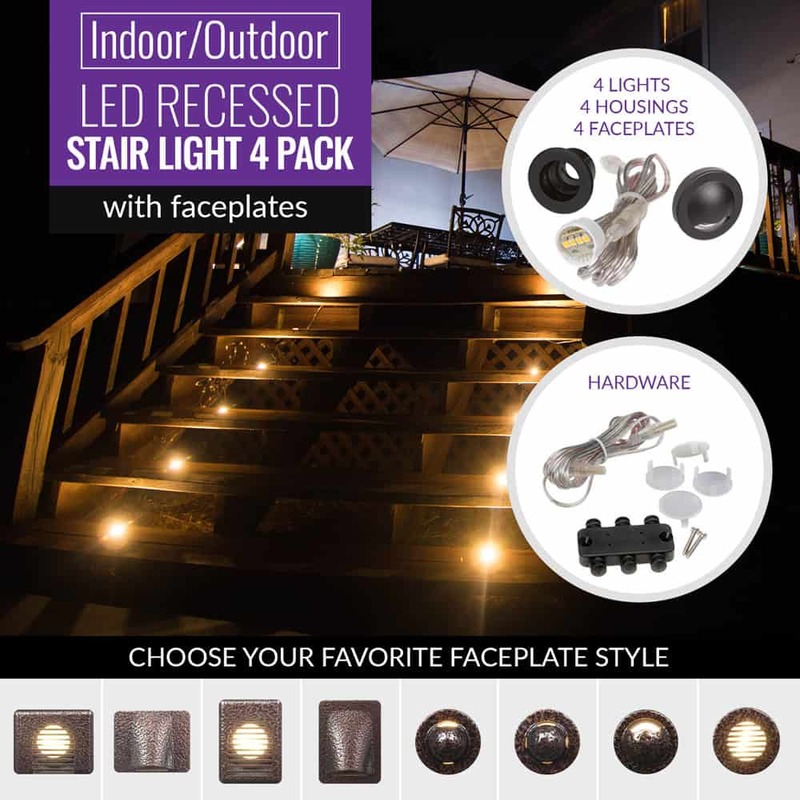 • FACEPLATE OPTIONS: Add custom stair accent lighting to your home with the addition of our LED faceplates. Choose from 8 unique styles, each with its own distinct lighting effect. Our handcrafted LED faceplates are available in 3 powder coating finishes - Antique Metal Black, Oil Rubbed Bronze, and Dark Copper Vein. 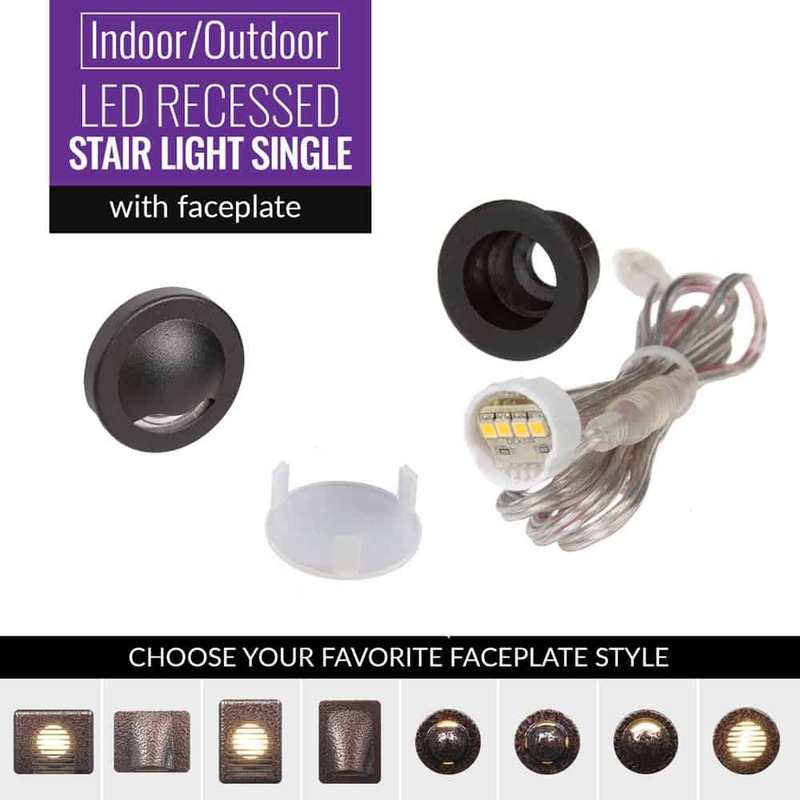 LED faceplates are sold in a stair lights 4 pack, indoor and outdoor kit, and as a single light. • EXPANDABLE OPTIONS: With every LED stair lights option from DEKOR, you have the ability to expand your lighting to fit any space. 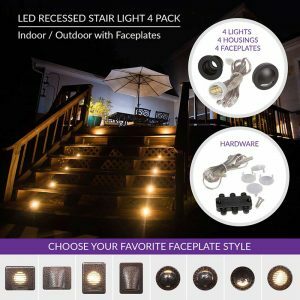 If you need more than just the included 8 lights to line your steps, you can purchase additional 4 packs to extend your options. 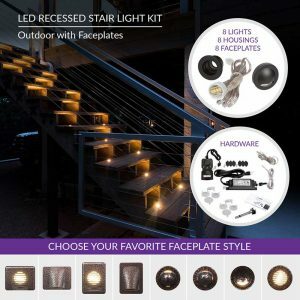 With the Step & Stair PaverDot and both the Indoor and Outdoor LED Recessed Lighting Kits, there’s always a way to create a complete lighting setup. • LED OPTIONS: With all LED stair lights system, your brilliant Cree LEDs are lined up horizontally, with 4 individual bulbs in a single row. This alignment produces a wider range of light, increasing visibility as you walk up the stairs. But, if our classic LEDs aren't bright enough for you, we have an upgraded option you can choose if you’re looking for extra sparkle. 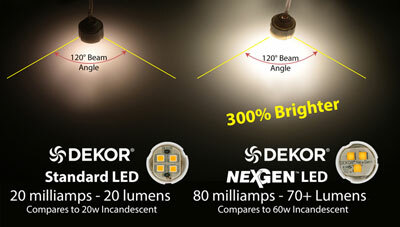 300% brighter than our classic LEDs, our NextGen option amps up the luminosity without increasing your energy footprint. Our classic LED option is 20 Lumens, while NextGen packs 70+ lumens into a single light. And because our NextGens are so bright, we’ve downsized the number of bulbs, with only 3 NextGen lights per unit, versus the standard 4 LEDs. • TRANSFORMER OPTIONS: The Standard EZ 36-watt 12VDC transformer can light up to 30 individual lights, allowing you to power up a complete system. 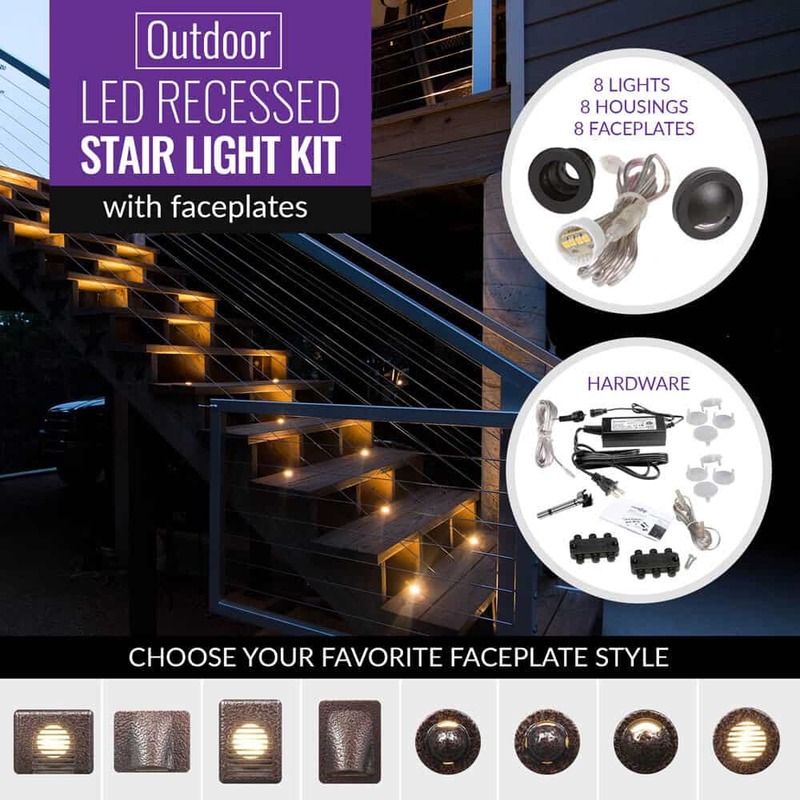 With both the Outdoor LED Recessed LED Stair Lights Kit and the Step & Stair PAVERDOT Light Kit, you have additional transformer options. If you're looking to expand your lighting beyond that, you can select a more powerful transformer to get the job done. The EZ 60-watt 12VDC transformer can power up beyond 30, and the EZ 100-watt waterproof transformer can take your lighting capabilities even further. 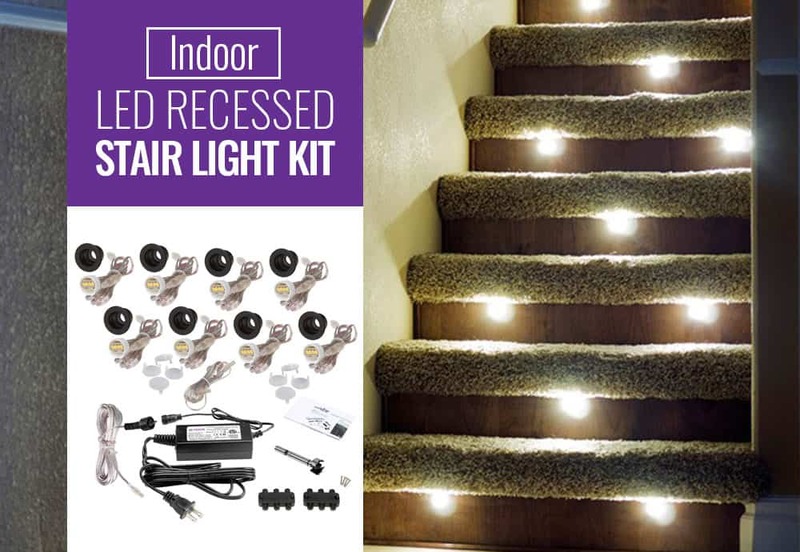 • CABLE LENGTH OPTIONS: The Step & Stair PAVERDOT Light Kit allows you to have options when it comes to your cable length. If you need a little extra space to get your lighting connected, you can select the 10 ft length option for your cables. Or, if you don’t want a chaotic cable mess because you don’t need all that wiring, you can choose the 5 ft option. • COLOR OPTIONS: With your LED stair lights, we understand that every home has a different look, and with that, a different color scheme. For our Indoor & Outdoor Recessed LED Stair Lights Kit, you can choose from a variety of powder coatings for your light housing. Ranging from Hammered White to Black Gold, you can find the perfect color to complement your home. • INSTALLATION OPTIONS: Depending on your process, you can select different installation options for your Step & Stair PAVERDOT Light Kit. If you’re planning to pour concrete to mold your lighting into your stairs as you create them, you can choose that option, with instructions to guide you along. 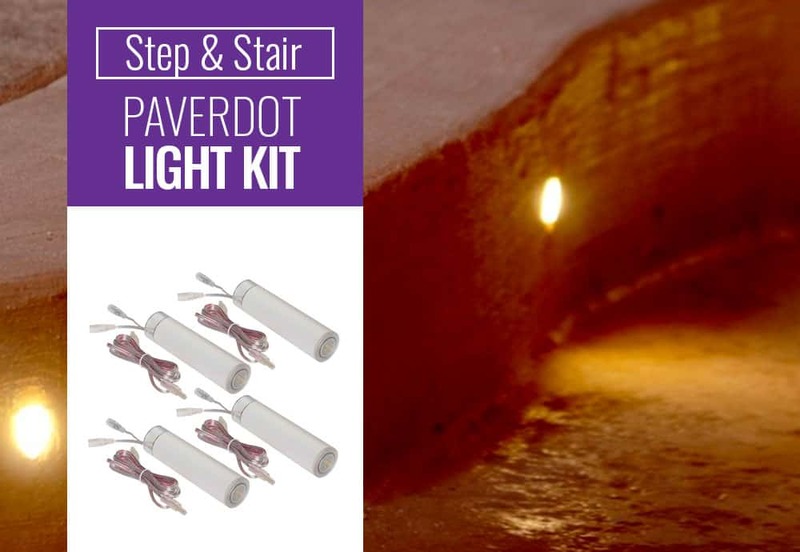 Or, if you’re planning to install Step & Stair PAVERDOTs into existing stone or pavers, you can select the Stone/PaverDot option for guided steps on how to successfully embed your lighting. When you buy DEKOR Lighting, you join a community of people who genuinely care about delivering the highest-quality product to our customers. Because we care so much about helping make your life easier, we provide a 10-year warranty with all of our LED stair lights systems and a 30-year warranty on our powder coating finish. As long as you use our lighting in unison with DEKOR transformers, you can remain protected from flaws in workmanship and materials. And because we create our lighting from scratch in our Colorado factory, we’re able to offer an unconditional, no-questions asked warranty our competitors can't match.